The Dorns. Courtney, Daniel, Watson, and Lisa. Watson Dorn never passes up an opportunity to educate someone about dairy farming. 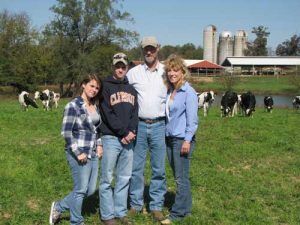 The third-generation dairy farmer in Edgefield, S.C., said he’s always known he wanted to operate a dairy farm, even as he was pursuing his degree in agriculture education from Clemson University. “It’s a blessing in a way to know what I wanted to do at an early age,” said Dorn, whose farm in western South Carolina has been in his family since 1764 and is currently situated on 640 acres with 220 cows. In addition to farming, Dorn also operates his own processing plant, selling whole milk to area retailers. Even with this busy schedule, Dorn is able to use his background in education when he opens up his farm and processing plant to schools and church groups for tours. “We get all kinds of questions because even some of the teachers are three generations removed from the farm,” Dorn said. He said a lot of people are surprised at the amount of technology used at the dairy farm, as well as the high level of care given to the cows. Dorn said he likes to illustrate the sterilization process milk goes through before it reaches the consumer. “I tell people that milk is extremely clean, and I guarantee that it’s cleaner than the glass they use to drink it from,” he said. While he enjoys educating visitors to his farm, Dorn’s real joy comes from the daily responsibilities on the farm. “The dairy farm is a great place to raise a family and I don’t get up in the morning and dread going to work. I get to do something different every day,” he said.